I’m Michele, and I’m so glad you’re here. If you’ve ever felt like you should be a bit tougher, stand up for yourself more, develop some grit, live life on your own terms, or create more adventure in your life, you’ve come to the right place. 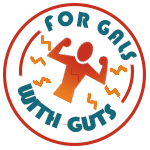 As you stroll through this site, you’ll journey through exercises that make you think, tools to help you grow, stories to inspire you, and advice that comes from hard-won experience. I share. If you find something useful, adopt it. If not, ignore it. Until you put it to use in your own life and find your own truth through experience, it’s just philosophy. Learn. Think. Be. Do. Rise. Shine. We believe every woman is innately powerful and mentally tough. We provide the impetus and advice you need to embrace that power and craft a legacy that will endure for generations. It’s hard to explicitly define a badass woman because she is many things. 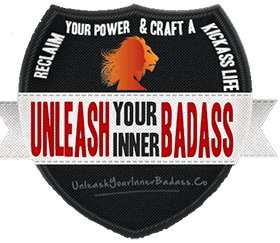 If you look into the core of any badass woman, however, you will find inner freedom, self-direction, and independence. A badass woman has gone through the fire but emerged stronger, better, and wiser. She consciously chooses who to allow in her life, but needs no one. She knows herself well and makes decisions based on her own desires, needs, and whims – not because someone else has expectations or desires. She recognizes her immense strength and power, and employs it as she positively contributes to this world. Visit the Thrive Section to discover tips and advice about becoming more resilient and mentally tough. You’ll also find topics on anything that enables you to make every day incredible and reclaim your personal power. Check out our Get Inspired Section to learn about women throughout history who have faced similar fears and limitations, but who found their inner strength and came out kicking. They exemplify how to be the strong, resilient, badass woman we know we can be. Want to be more mentally tough at work or in business? Want to forge your own path or earn an income unconventionally? Hop over to the Lead Section! Has life become boring? Get tired of doing the same things day in and day out? Make every day an exciting adventure. Find tips to make that a reality in the Adventure Section. Prefer action-oriented tasks or exercises that bring results quickly? Peruse the Toolbox Section. What?? You don’t have a photographic memory? You don’t automatically remember everything you read or hear? Me either. That’s why you should visit the Resource Library. It’s chock full of checklists, worksheets, quizzes, and other tools to help you remember and take action. THANK You for being here – and for being you! I’m here to share and guide. I do not stand above or ahead of you. I stand beside you. We are all equal parts of an amazing sisterhood that is currently about 3.76 billion strong. What would this world become if all 3.76 billion women alive on the planet today understood, embraced, and utilized their immense strength, power, and gifts? What if each girl and woman on this planet improved themselves and then reached out to help her other sisters find and express their power? The impact on our world would be beyond our wildest imaginings. Start today. Let us journey together. There’s a bit more info on our About Page, so check it out! I’ve experienced some big stuff and come out the other side stronger and wiser. If you want to know more, read my books at Amazon . I designed this website, so if you like what you see and would like to have your own website, you can hire me to create one for you! This site is designed to be interactive, hands-on, and immersive. It means you’ll glean the most info here if you don’t just click through the pages, mindlessly reading articles or gawking at images. As you visit different parts of this website, save the snippets, sentences, and images that resonate with you. Jot down your own notes as soon as you add them. If there’s something you’d like to remember or investigate a bit more, save and notate those, too. I’ve included interactive calculators, tools, downloadable checklists, worksheets, quizzes, videos, etc. throughout the site. Take the time to use them. If you do, you’ll get more out of what you encounter here, and you’ll be less likely to forget what you found as soon as you’ve skipped off to your next website. And finally, I encourage you to leave comments or email me directly. Yep, I’m a real person, and I assure you I’ll respond ASAP. Here is our creed containing 10 guiding principles. 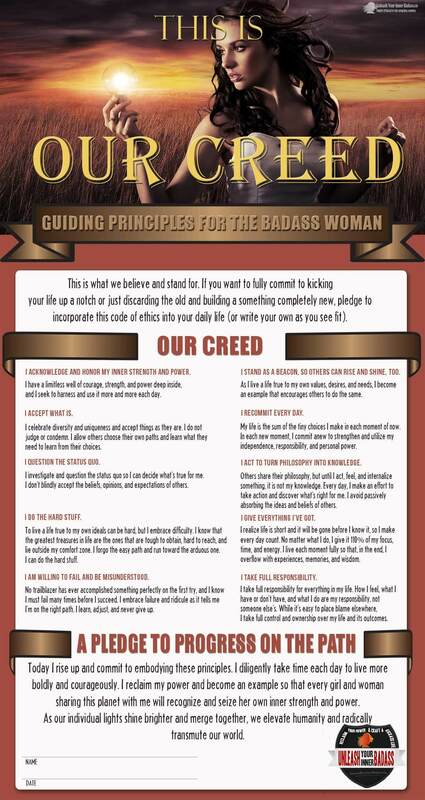 Feel free to print it, (click here to get the pdf), save it (right click then “save image as…”), or share with the badass women you know! Introduce yourself. Feel free to ask a question or just share what's on your mind. How can I help you?